2018 is finally here and with a new year comes new trends. Here are five wedding trends to look out for this year. Weddings in 2018 will see a return to formality and tradition. This has caused some wedding planners to proclaim, “The wedding cake is back!” and leaves us asking, “Did it ever leave”? More couples are showing an interest in traditional wedding moments, like cutting the cake. As such, having a cake that makes a statement is important. This doesn’t mean you can’t add variety and an element of fun with an array of desserts. 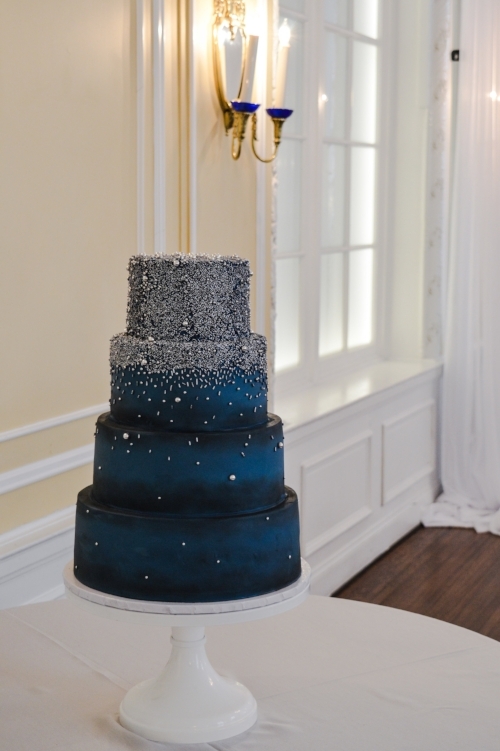 Creative dessert bars continue to be a popular complement to the more formal wedding cake. When it comes to wedding desserts in 2018, it’s the best of both worlds. With Pantone naming Ultra Violet as their 2018 color of the year, wedding planners are looking to the cooler shades of the color wheel for inspiration. Any variety of blues and purples will be popular this year. Don’t be afraid to highlight this broodingly romantic palette’s darker tones. These shades beautifully complement the popular metallic accents we saw last year and will keep seeing in 2018. It also underlines a growing preference for navy, over black, as a grounding neutral at many weddings. Last year many brides took inspiration from nature for their decorations. This trend continues in 2018 with natural elements like stone and marble gracing everything from cakes to the dance floor. Looking for a subtler nod to the natural world? Geometric shapes will also star in the weddings of 2018. 2-D tessellations can add a unique look to any cake. Opting for 3-D forms as cake toppers or table decorations is increasingly popular and can really make a statement. 2018 is a year to celebrate texture from the wedding dress to the table linens to the invitation. When it comes to this trend there are very few rules, so be bold. Get creative and draw attention to your favorite details. Always loved the bold patterns of Art Deco or the romantic embellishments of the Victorian era? 2018 is the time to highlight classic design at your timeless event. This is an excellent opportunity to bring in some personalized, hand-made, and even couture elements to your wedding day. While rustic outdoor weddings may have been dominating the scene for the past few years, 2018 will see a return to indoor weddings. This fits in with the overall return to formality. Indoor weddings are taking a cue from interior design. The popularity of Mid-Century Modern design is influencing weddings in a variety of ways. Nods to this sleek design period can be as simple as a cake topper or pervade the entire look of the event. Venues with large windows and transparent tents invite the whimsy of the outdoors while framing the environment in a more modernist setting. With so much variety, there is sure to be a trend in 2018 that fits in with your personal wedding vision. Many of these trends are highly adaptable and provide ample room to highlight the personal tastes and personalities of the bride and groom. 2018 seems to be the perfect year to make your wedding dreams come true. Happy wedding planning and happy New Year!